From left, Bradford Young with Department of Visual Arts professor Brian Cross on April 27. 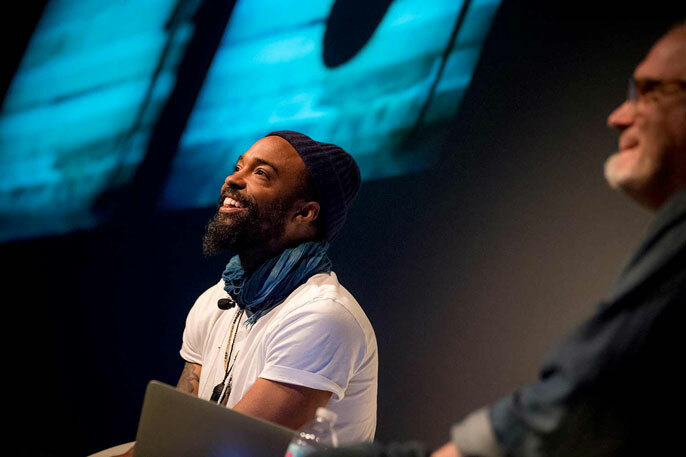 Academy Award-nominated cinematographer Bradford Young was at UC San Diego April 27, sharing insight into his craft and career as a black artist. Young — the first speaker in the Adam D. Kamil Guest Lecture series — first met privately with students from the Department of Visual Arts and then held a public discussion at the Price Center Theater. Young is best known for his work on the award-winning “Selma” and “Arrival,” the 2016 film for which he received multiple accolades, including the Oscar nomination. It was the first time an African-American cinematographer had been nominated in the category, and the first person of color to be nominated since 1998. On set, the cinematographer is most involved with creating the visual tone of a film or project, helping the director with lighting, shot selection and the artistic and technical decisions of camera operation. Also known as the director of photography, the cinematographer is the lead over camera and lighting crews, and the visual impact of a film is driven by this position. Bradford Young (center) spent the day at UC San Diego meeting and talking with students, faculty and staff. Young twice won cinematography awards at the Sundance Film Festival: in 2011 for his first feature film, “Pariah” and then again in 2013 for both “Mother of George” and “Ain’t Them Bodies Saints.” Following “A Most Violent Year” and “Where is Kyra,” staring Michelle Pfeiffer and Kiefer Sutherland, Young accepted the lead on the much-anticipated, forthcoming film “Solo: A Star Wars Story.” Directed by Ron Howard, “Solo” is set to be released Memorial Day weekend. And while he hinted at a new look for “Star Wars,” it was with “Pariah” where Young said he first felt the impact of what he could do as a cinematographer. Written and directed by Dee Rees, the film tells the story of an African-American girl coming to terms with her sexuality. Young said he and Rees wanted to make a textured coming-of-age film that was both dark and grainy, as well as colorful. It was Department of Visual Arts professor and artist Brian Cross who invited Young to campus, in part because of their shared connection of using pictures to tell stories and create community. A well-known director and photographer in rap and hip-hop, Cross’s photo-essay collection “Ghostnotes: Music of the Unplayed” was released in late 2017. Cross said that, in many ways, Young’s use of color and his own black identity become characters within the films, saying the cinematographer has the capacity to make viewers see in a way they haven’t seen before. Young’s time at UC San Diego as the first Adam D. Kamil Guest Lecture speaker was due to the commitment and generosity of the Kamil family, who have supported film and visual arts on campus in memory of their son for multiple years. “We have them to thank for the Adam D. Kamil Gallery, the Kamil film competition … and now, today, a further contribution to the culture of this university,” Cross said in acknowledgement of the Kamils, who attended the talk with Young. Welcoming participation from all UC San Diego students with an interest in filmmaking, winners of this year’s Adam Douglas Kamil Student Media Awards will be announced at a reception May 18 in the Adam D. Kamil Gallery in Mandeville Center.